I carried mine since the IA policy was quiet regarding the issue... I saw in a local group that someone did ask and posted that the IA was ok with it. If local magazine ordinances like what Los Angeles are allowed to stand CCW’ing will be even more complex. Not CCW, but after testing out my 6 XD SCM, I am now. Got the guns nice and dirty and ran Federal HST's thru them. No issues. Although I did have a failure to go bang. Got a good solid hit on the primer, deep indentation. Loaded it back up and it went bang. Springfield Armory XD9 4" Service Model (wifes). Los Angeles does NOT have a local law restricting +10 round magazines. They ended that in 2017. I understand it expired (I dropped the word "had" in my quick post) I am saying if they start allowing these localities to preempt state law and make their own rules things will get messy quick. Look on the back of your ccw card. There is a section called "Description of Weapons" and a section called "Restrictions". Follow what they say, if anything. LOL. I guess you don't understand that "cards" are issued by IAs and not all the same. The actual LTC is the state form 99-32872 which is a one sided piece of paper. MY IA issues cards too but puts restrictions on the front. Never heard of or seen a form "99-32872" for the state license, and that doesn't comport with state form numbering protocols. -The FD 4501 (10/99) was issued under the "Firearms Division". -The BOF 4501 (11/08) was issued under the "Bureau of Firearms"
My 2013/2015/2017 licenses were all on the BOF 4501. My 2019 license is on the 1999 FD form. Somebody must have found a box and stuck them in the printer. The licenses have two sides; one side is blank. Last edited by Dvrjon; 04-16-2019 at 3:30 PM..
Got curious so I look at my rice paper permit, I see 99 32872 between the thumb print and picture. I also see FD 4501 (10/99) at bottom right of the card. Most importantly, no restrictions . G29 + A&G grip extenders + G20 mags = 5 and a quarter tons of m.e. It all depends on the IA and their format. Here are copies of the old style 'rice paper' licenses that were issued by the HCSO. 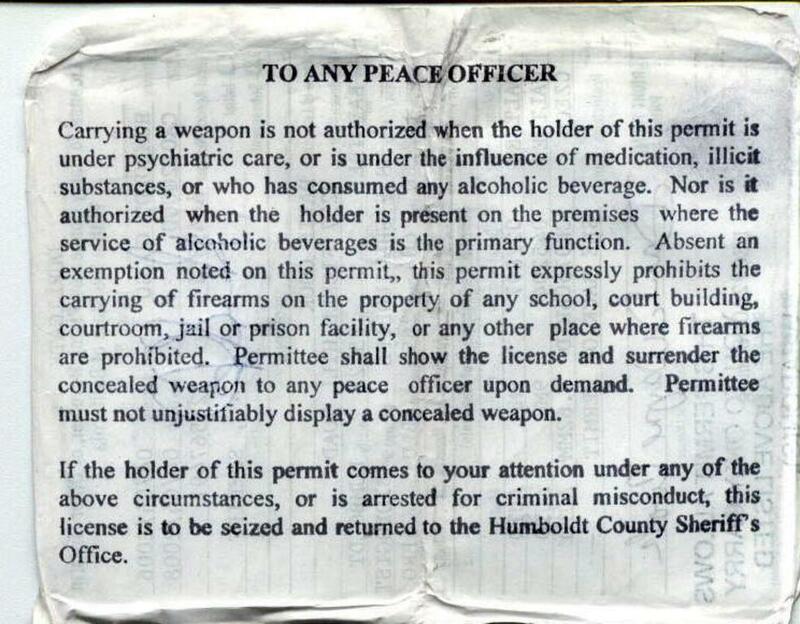 I have had a CCW License since 1999 here in Humboldt County. The "99-32872" number is the job number from the old Office of State Printing (Now Office of State Publishing). They used to print all forms for all state agencies. The form number is the FD (or BOF) 4501 with the revision date in parentheses. Here's my "rice paper" license from some years ago. 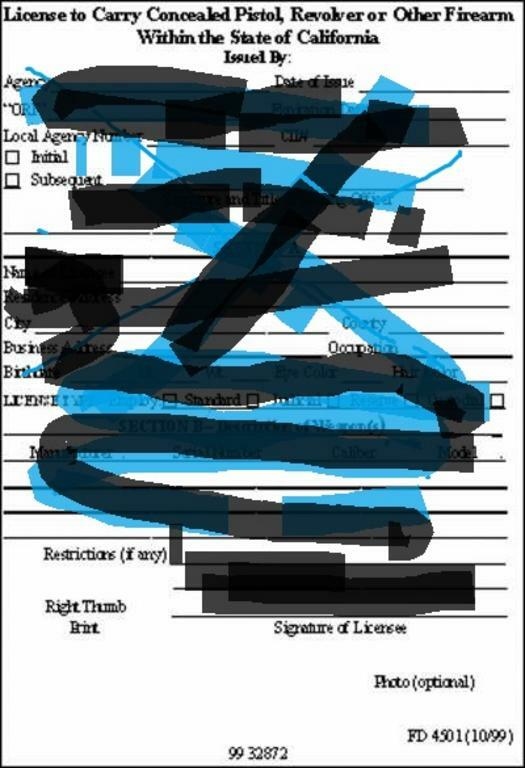 The IA had begun stamping pre-printed forms with the restriction in red. When I pointed out the stamp failed at the end, he hand-wrote the ending. Under that admonition are two printed areas outlined in yellow. The lower block in the middle reads "OSP 09 117265"; That's the print job number. The block to the right is "BOF 4501 (11/08)"; That's the State form number, as revised in Nov 2008. But that doesn't mean the printing was done in '08, only that they are printing the '08 version. The small block outlined in black in the middle is a "Union Label", as the print shop was union-controlled. I stand corrected about the form number but, the paper permit is the state standard. The hard cards are not required by law or standardized in any way. I believe PC 26175 (B) changed that and allowed any license an IA issues to be valid as long as it "substantially complies" with the requirements in subdivision (i). 26175 (B) The Attorney General shall approve the use of licenses issued by local agencies that contain all the information required in subdivision (i), including a recent photograph of the applicant, and are deemed to be in substantial compliance with standards developed by the committee described in subparagraph (C), if developed, as they relate to the physical dimensions and general appearance of the licenses. The Attorney General shall retain exemplars of approved licenses and shall maintain a list of agencies issuing local licenses. Approved licenses may be used as indicia of proof of licensure under this chapter in lieu of the uniform license developed by the Attorney General. (i) Any license issued upon the application shall set forth the licensee’s name, occupation, residence and business address, the licensee’s age, height, weight, color of eyes and hair, and the reason for desiring a license to carry the weapon, and shall, in addition, contain a description of the weapon or weapons authorized to be carried, giving the name of the manufacturer, the serial number, and the caliber. The license issued to the licensee may be laminated. Last edited by baggss; 04-17-2019 at 5:29 PM.. True, however, this part of the conversation regards the form number of the State's rice paper license. Additionally, since the OAG doesn't appear to have issued guidance on form or to have approved specific local licenses, those plastic cards still appear to be secondary IDs and not licenses. Last edited by Dvrjon; 04-18-2019 at 6:52 AM.. It was directed at the second sentence of the post I replied to. As for what it appears our AG may or may not have done, I submit it probably doesn't matter. Many IAs view them as the defacto LTC at this point. I never stopped using a standard capacity magazine. But seriously, it does. I'll probably go with a 10-round in the mag well and a couple SCMs in my magazine holster. "Criminals are a small minority in any age or country. 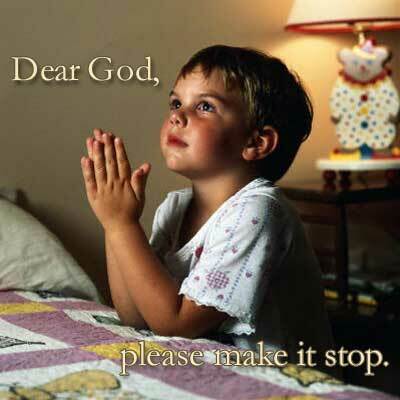 And the harm they have done to mankind is infinitesimal when compared to the horrors—the bloodshed, the wars, the persecutions, the confiscations, the famines, the enslavements, the wholesale destructions—perpetrated by mankind's governments." The length of barrel isn’t more difficult to conceal; printing the grip isn’t a problem, either. The 19 will take the 17 mags and the 30 will take the 21 mags. But, at some point, weight overshadows utility. My 26 is now wearing G17 mags with Magpul spacers. 2 mags + 1 in the chamber = 35 rounds, and my pinkie finger has a place to hold on.